Ciliary and rhabdomeric opsins are employed by different kinds of photoreceptor cells, such as ciliary vertebrate rods and cones or protostome microvillar eye photoreceptors, that have specialized structures and molecular physiologies. We report unprecedented cellular co-expression of rhabdomeric opsin and a visual pigment of the recently described xenopsins in larval eyes of a mollusk. The photoreceptors bear both microvilli and cilia and express proteins that are orthologous to transporters in microvillar and ciliary opsin trafficking. Highly conserved but distinct gene structures suggest that xenopsins and ciliary opsins are of independent origin, irrespective of their mutually exclusive distribution in animals. Furthermore, we propose that frequent opsin gene loss had a large influence on the evolution, organization and function of brain and eye photoreceptor cells in bilaterian animals. The presence of xenopsin in eyes of even different design might be due to a common origin and initial employment of this protein in a highly plastic photoreceptor cell type of mixed microvillar/ciliary organization. Animal eyes have photoreceptor cells that contain light-sensitive molecules called opsins. Although all animal photoreceptor cells of this kind share a common origin, the cells found in different organisms can differ considerably. The photoreceptor cells in flies, squids and other invertebrates store a type of opsin called r-opsin in thin projections on the surface known as microvilli. On the other hand, the visual photoreceptor cells in human and other vertebrate eyes transport another type of opsin (known as c-opsin) into more prominent extensions called cilia. It has been suggested that the fly and vertebrate photoreceptor cells represent clearly distinct evolutionary lineages of cells, which diverged early in animal evolution. However, several organisms that are more closely related to flies than to vertebrates have eye photoreceptor cells with cilia. Do all eye photoreceptors with cilia have a common origin in evolution or did they emerge independently in vertebrates and certain invertebrates? The photoreceptor cells of a marine mollusc called Leptochiton asellus, are unusual because they bear both microvilli and cilia, suggesting they have intermediate characteristics between the two well-known types of photoreceptor cells. Previous studies have shown that these photoreceptor cells use r-opsin, but Vöcking et al. have now detected the presence of an additional opsin in the cells. This opsin is a member of the recently discovered xenopsin family of molecules. Further analyses support the findings of previous studies that suggested this type of opsin emerged early on in animal evolution, independently from c-opsin. Other invertebrates that have cilia on their eye photoreceptors also use xenopsin and not c-opsin. The findings of Vöcking et al. suggest that, in addition to c-opsin and r-opsin, xenopsin has also driven the evolution of photoreceptor cells in animals. Eye photoreceptor cells in invertebrates with cilia probably share a common origin with the microvilli photoreceptor cells that is distinct from that of vertebrate visual cells. The observation that two very different types of opsin can be produced within a single cell suggests that the molecular processes that respond to light in photoreceptor cells may be much more complex than previously anticipated. Further work on these processes may help us to understand how animal eyes work and how they are affected by disease. Animal eyes are amongst the best-investigated sensory organs and are subject to studies not only in sensory biology, but also in general molecular, developmental and evolutionary biology. Comparative investigations yield insights into the diversity of light-detection mechanisms and their function across animals. Further, the integrative data sets on eyes and their cellular components has had considerable impact on the characterization of different kinds of light-detecting cells, and on concepts how to trace their evolution and that of the organs they constitute (Arendt, 2003; Arendt et al., 2016; Oakley and Speiser, 2015; Wagner, 2014). These studies have dealt with the general question of whether gradual change or rather integration and reshuffling of modules that also exist elsewhere is the main driving force in the evolution of light-detecting cell types. Traditionally, photoreceptor cells (PRCs) have been characterized mainly by their general electrophysiological response and their fine structure, which reveal clear differences between the two main systems of interest, the eyes of insects and those of vertebrates. The PRCs in insects have been shown to enlarge the sensory area by microvilli and to depolarize in response to light, whereas vertebrate eyes are hyperpolarizing and bear a modified cilium (Eakin, 1963; 1968, 1979). These findings initiated a wealth of comparative studies and resulted in pro-longed debates on whether a few conserved lineages of animal eye PRCs exist or whether both those PRCs andwhole eyes evolved multiple times independently (Eakin, 1982; von Salvini-Plawen, 1982; Vanfleteren, 1982). Subsequent data on molecular physiology and transcriptional regulation of cell specification allowed much more detailed characterization of PRCs,suggesting that two conserved PRC types are indeed the main sensory components of animal cerebral eyes: (a) microvillar depolarizing r-opsin-expressing PRCs, which signal via the Gq-mediated IP3 cascade, and (b) ciliary hyperpolarizing c-opsin-expressing cells, which signal via the Gi/t-mediated cGMP cascade (Arendt et al., 2002a, 2004; Fain et al., 2010; Fernald, 2006; Gehring, 2014). This evolution-based classification of PRCs became a sound basis for many kinds of comparative eye research and for ideas about how animal eyes evolved. The r-opsin+ type of PRCs constitutes the main visual elements in many protostome cerebral eyes, but they are also present in the ganglion cell layer of vertebrate eyes, where they are involved in the pupillary reflex and the entrainment of the circadian clock (Hattar et al., 2003; Koyanagi et al., 2005; Panda et al., 2002). Ciliary c-opsin+ PRCs on the other hand are predominantly known as the visual PRCs of vertebrate eyes and the frontal eye of cephalochordates (Vopalensky et al., 2012), while their role in protostomes is controversially discussed. 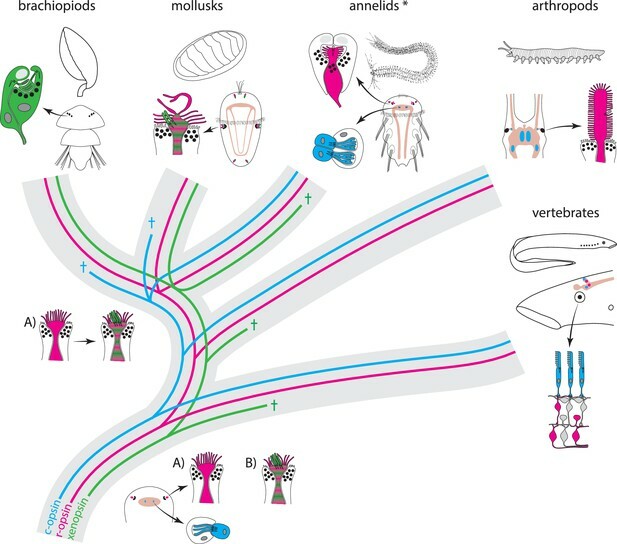 In protostomes, c-opsins were initially reported only in arthropod and annelid deep brain photoreceptors (Arendt et al., 2004; Velarde et al., 2005). It was assumed, therefore, that this visual pigment was ancestrally employed by unpigmented brain PRCs that were fulfilling non-visual functions and were only secondarily integrated into the eyes of chordates (Arendt et al., 2004; Vopalensky et al., 2012). Reports on the presence of ciliary PRCs and c-opsins in the eyes of protostomes challenged this view and also the concept of gradually evolving ancient PRC types in animal eyes. Accordingly, a rather flexible employment of different opsin types by eye photoreceptor cells or frequent gain and loss of photoreceptor cell types in cerebral eyes during the evolution of bilaterian animals were suggested (Passamaneck et al., 2011). Advances in opsin phylogeny, however, suggest that several protostome sequences, which share characteristic sequence motifs with c-opsins and were initially classified as such, fall into their own group, now termed xenopsins (Ramirez et al., 2016). In this situation, it is highly desirable to obtain deeper insights into the evolutionary history of c-opsins and xenopsins and their employment in animal photoreceptor cells, especially in those of protostome invertebrates. By deeply mining public and new data, we find xenopsins to be present in several taxa of protostome invertebrates. Although we did not find even a single case of co-existence of c-opsins and xenopsins in any organism, our phylogenetic and gene structure analyses strongly suggest that xenopsins and c-opsins are two distinct opsin subgroups. 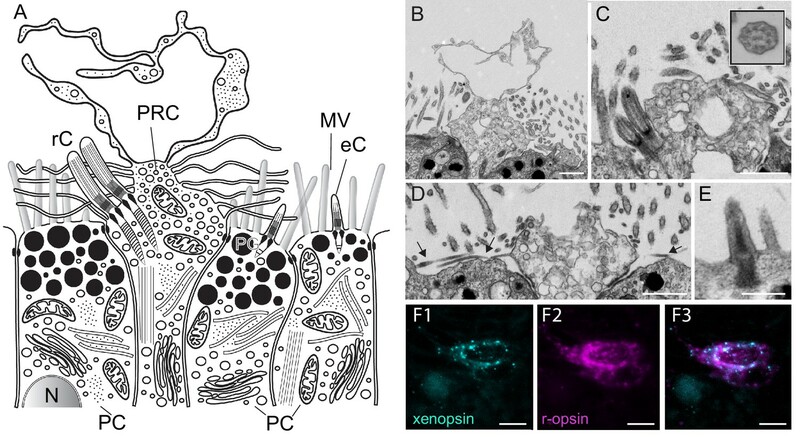 A new xenopsin from Leptochiton asellus, a member of the basally branching mollusk group of chitons, is found to be co-expressed with r-opsin in PRCs bearing both microvilli and cilia. This raises interesting questions about the light transduction and molecular physiology of the cells and their evolutionary origin. Recompilation of existing and new data challenges the dichotomous distinction of bilaterian eye PRCs into ciliary c-opsin+ and microvillar r-opsin+ cell types, but nevertheless supports the view that conserved lineages of eye PRCs exist. We suggest that a highly plastic PRC type of mixed microvillar/ciliary organization and frequent lineage-specific loss of c-opsins and xenopsins were important players in animal eye evolution. By screening RNA-seq data of Leptochiton asellus, we detected a sequence showing clear opsin characteristics. This was substantiated by reciprocal BLAST as well as domain and motif analyses. The sequence possesses the Pfam tm7_1 domain, Lys296 (referring to homologous bovine opsin positions), which is predictive for opsin chromophore binding, as well as the NPXXY motif and the tripeptide motif on positon 310–312 crucial for G-protein activation (Figure 1D). The latter matches the NKQ motif, which is characteristic for c-opsins but is also present in some sequences of the recently described group of xenopsins (Ramirez et al., 2016) and a few cnidops. Correct placement of the new L. asellus opsin is highly relevant for our study and, according to Ramirez et al. (2016), several sequences initially described as c-opsins fall into xenopsins. We therefore performed a thorough phylogenetic analysis with a main focus on the relationship of c-opsins and xenopsins. For this purpose, we ran both maximum-likelihood and Bayesian analyses to check for congruence of different tree inference algorithms, we chose closely related representatives from amongst rhodopsin-like G-Protein coupled receptors as an outgroup, and we extensively tested standard and data-set specific (DS-GTR) evolutionary models for appropriateness. Expression of a new visual pigment (xenopsin) in the L. asellus larva. In order to increase the taxon sampling of potential c-opsins and xenopsins in protostomes, we mined publicly available genomic and transcriptomic resources and de novo assembled transcriptomes from publicly available raw Illumina RNA-seq data from 9 nemerteans, 10 flatworms, 7 aceoelomorphs and Xenoturbella and from new RNA-seq data from the annelid Owenia fusiformis. An initial maximum-likelihood run with RAxML yielded low support for many basal branches. Thus, we performed a leaf-stability analysis based on the bootstrap results to identify rogue sequences. One sequence of Strongylocentrotus purpuratus (opsin2) and one of the brachiopiod Lingula anatina (peropsin A) as well as ctenopsin sequences exhibited leaf-stability values less than 0.55. As we were interested in whether ctenopsins are closely allied to c-opsins and xenopsins, only the opsin2 and peropsin A sequences from S. purpuratus and L. anatina were removed from the dataset. Subsequent maximum-likelihood and Bayesian runs yielded nearly identical tree topologies. In line with the study by Ramirez et al. (2016), c-opsins and xenopsins form distinct and highly supported groups (Figure 2, Figure 2—figure supplement 1). The new opsin from L. asellus groups with high support within xenopsins and is thus termed L. asellus xenopsin. In addition to the xenopsins reported by Ramirez et al. (2016) from mollusks, brachiopods and rotifers, we discovered this opsin type in Owenia fusiformis, a member of the basally branching annelid group of Oweniidae, in several polyclad flatworms and in the triclad flatworm Schmidtea mediterranea. By contrast, no previously unidentified c-opsin sequence showed up in any new major animal group. Other groups might be devoid of both xenopsins and c-opsins. We did not find any c-opsin or xenopsin in the nine screened RNA-seq datasets from acoelomorphs or xenoturbellids. Although reasonable numbers of opsins were found in some of those species, reciprocal blast suggests that these proteins are mainly related to r-opsins. The situation is more ambiguous in nemerteans. From the nine screened RNA-seq datasets, we found higher numbers of opsin sequences only in Lineus longissimus, but no hints that there are c-opsins or xenopsins in any nemertean species. The low yield of opsin sequences may reflect the real situation or may be due to low sequencing coverage or the tissue samples taken. Opsin phylogeny and gene structure analysis. Majority consensus tree of Bayesian analysis (Phylobayes, DS-GTR + Γ, 60,000 cycles). Bayesian posterior probabilities and bootstrap values from parallel RAxML analysis are shown. See Figure 2—figure supplement 1 for uncollapsed tree and Figure 2—source data 1 for gene accession numbers. Intron positions (colored bars) are mapped on the uncurated protein sequence alignment and conserved positions are highlighted by bars spanning several sequences. See Figure 2—figure supplement 2 for full opsin gene structures and Figure 2—figure supplement 3 for intron phases. The new L. asellus opsin falls with high support into the group of xenopsins, which is only distantly related to c-opsins. All major c-opsin subgroups share three conserved intron positions. While cnidops that form the sister group of xenopsins lack introns, the two intron positions that are conserved in xenopsins do not overlap with those of c-opsin introns, indicating independent evolutionary origins for xenopsins and c-opsins. The r-opsin sequences included in the gene structure representations are those of A: Apis mellifera UV opsin; B: Limulus polyphemus UV-like opsin; C: Crassostrea gigas r-opsin 10013541; and D: Homo sapiens melanopsin. Further, our data suggest that xenopsins diversified at an early stage of protostome evolution. Xenopsin paralogs of several platyhelminth species are distributed across two well-supported xenopsin subgroups, one of which also contains sequences from many other protostome taxa (Figure 2, Figure 2—figure supplement 1). Notably, the tripeptide motif that is crucial for G-protein activation shows a pattern similar to that found in c-opsins (NKQ) within that xenopsin subgroup, which has a broad taxonomic distribution, and in the sequence of Idiosepius paradoxus, while this pattern differs considerably in other xenopsins (Figure 1—figure supplement 1). Ramirez et al. (2016) reported that xenopsins were secondarily lost in several major animal groups. Our data support this view and the same is obviously true for c-opsins. Thus, we specifically compared the presence of c-opsins and xenopsins across bilaterian animals. Even though genomic resources were screened for many species, stunningly we could not recover a single species possessing both c-opsins and xenopsins. This also holds true for higher taxonomic levels, since as sequences of just one of the two opsin groups were found in deuterostomes and in major protostome clades such as mollusks, rotifers, brachiopods, flatworms, arthropods and tardigrades. As the only exception, we found xenopsins (but no c-opsins) in the annelid Owenia fusiformis, whereas other annelids such as Platynereis dumerilii possess only c-opsins or lack both types as do Capitella teleta or Helobdella robusta (Figure 2, Figure 2—figure supplement 1). Such a mutually exclusive taxonomic distribution of protein subfamilies is difficult to explain from an evolutionary perspective and raises the question of whether the distinction of xenopsins and c-opsins may be caused by tree inference artifacts. Thus we performed gene structure analyses in order to obtain independent information on this matter. Position and phase of introns were determined for all those sequences for which genomic information was publicly available and the new sequences for L. asellus opsin and P. dumerilii c-opsin, for which the whole gene sequences cloned from genomic DNA. The obtained data were than mapped onto the un-curated protein alignment to identify introns located in homologous sequence positions (Figure 2, Figure 2—figure supplement 2). This revealed highly conserved and specific exon–intron patterns for many major opsin groups. The patterns differ considerably between xenopsins and c-opsins. Three introns are highly conserved in position and phase (Figure 2, Figure 2—figure supplement 2) and phase (Figure 2—figure supplement 3) throughout protostome c-opsins, deuterostome encephalopsins, TMT opsins, VA-opsins, parapinopsins and pinopsins, and the vertebrate visual opsins. By contrast, all xenopsins share two different intron positions with conserved intron phase (Figure 2—figure supplements 2 and 3), with the exception of one sequence from Adineta vaga. While the second xenopsin intron position is clearly distinct from those of any c-opsin intron, the first xenopsin intron has a position similar to that of the second c-opsin intron. In order to investigate whether the minor positional difference between these two c-opsin and xenopsin introns are potentially caused by alignment artifacts rather than independent evolutionary origin, we mapped the gene structures onto several different alignments obtained with MAFFT- E-INS-i, MAFFT-G-INS-I, GLProbs, ProbCons and MUSCLE. In all cases, the three conserved c-opsin and two xenopsin introns are recovered. The position of the second c-opsin intron is not stable only in the MUSCLE alignment. This coincides with the poor quality of the MUSCLE alignment in this region when compared to the other alignment variants. The xenopsin and c-opsin intron positions do not overlap in any of the alignments. Thus, gene structure provides strong evidence that xenopsins and c-opsins are indeed distinct opsin subgroups, irrespective of their mutually exclusive distribution amongst bilaterian animals. Due to the lack of introns in cnidops, the gene structure analyses cannot provide further support for the sistergroup relationship of cnidops and xenopsins. Likewise, ctenopsins show a very characteristic gene structure and subdivision into two groups, but no clear similarities to c-opsins or xenopsins exist. Notably, Strongylocentrotus purpuratus opsin2 and Lingula anatina peropsin-like A, which were excluded from the current analysis due to low leaf stability, share conserved introns (Figure 2—figure supplement 2), strongly corroborating the very small but ancient group of bathyopsins reported by Ramirez et al. (2016). In order to investigate the expression pattern of Las-xenopsin, we performed in-situ hybridization analyses in different larval stages of L. asellus. This revealed expression in the posttrochal eye region (Figures 1B and 3F) as well as in cells at the very apical (Figure 1B inset) and posterior ends of the larva (Figure 1C), an expression pattern strongly resembling that of Las-ropsin (Vöcking et al., 2015). Double in-situ hybridization unambiguously showed cellular coexpression of Las-xenopsin and Las-ropsin in all PRCs (Figures 3F and 4A). Fine structure of the eye photoreceptor cell surface and co-expression of Las-xenopsin and Las-ropsin in the eye. (a) Schematic representation of eye structure based on serial section EM data. (b–d) EM micrographs of the apical surface of eye photoreceptor cells (PRCs). (b) Microvillar-like vertical extensions of the eye PRC. (c) Two cilia emerging from eye PRC (inset: cross section of eye PRC ciliary axonem showing 9 × 2 + 2 pattern). (d) Horizontal microvilli (arrows) emerging from eye PRC. (e) Rudimentary cilium of adjacent epidermal cell. (f1-3) Double in-situ hybridization shows that Las-xenopsin and Las-r-opsin are coexpressed in eye PRCs. (Scalebars: 2 µm in b–e, 5 µm in f). eC, epidermis cell cilium; MV, microvilli; N, Nucleus; PC, pigment cell; PG, pigment granules; rC, photoreceptor cell cilium. Expression of Las-xenopsin as well as genes involved in ciliary opsin transport and development of cilia. Column 1: single labeling of gene X. Column 2–4: double labeling of gene X (cyan) and Las-r-opsin (magenta) in the anterior, posttrochal eye and posterior regions. Las-xenopsin (a1–a4), Las-Arf4 (b1–b4), Las-rab8 (c1–c4), Las-FIP3 (d1-4), Las-RPGR (e1-4), Las-Myosin VIIa (f1-4), Las-foxj1 (g1-4) and Las-RFX (h1-4) are coexpressed with Las-r-opsin in anterior, eye and posterior PRCs. 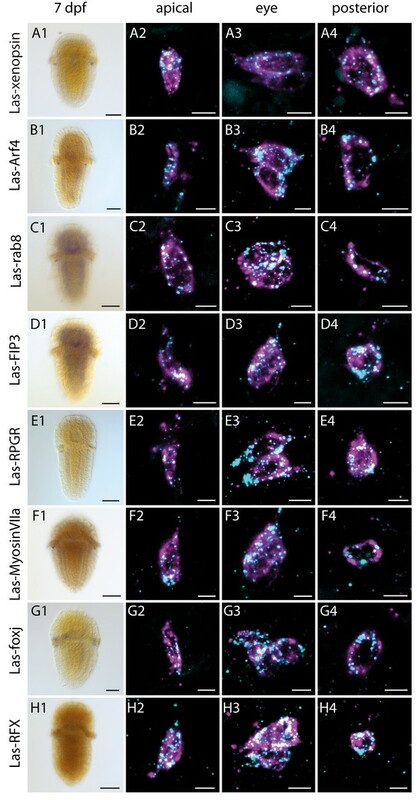 Additionally, Las-rab8 (c1) and Las-FIP3 (d1) show a broader expression in the nervous system of 7 dpf larvae and Las-foxj1 shows expression also in the apical area and prototroch cells of young larvae (Figure 4—figure supplement 1). See Figure 4—figure supplements 1–3 for gene trees of Arf4, FIP and RFX. (Scalebars: 100 μm in column 1; 5 μm in columns 2–4). The eye PRCs of L. asellus have been shown to be largely of rhabdomeric organization and the r-opsin protein is most likely localized in the microvillar extensions (Vöcking et al., 2015). The only xenopsin with known expression site is from the brachiopod T. transversa. It was originally described as a c-opsin and is expressed in the ciliary PRCs of the larval eyes. For this reason, we searched for indicators of cilia development in the PRCs of L. asellus by means of in-situ hybridization, i.e. we looked for the transcription factors Foxj1 and RFX, which are involved in ciliary development in different animals (Alten et al., 2012; Choksi et al., 2014; Dubruille et al., 2002; Yu et al., 2008). Both are expressed in the PRCs of 7 dpf L. asellus larvae (Figure 4G,H, Figure 4—figure supplement 1) and Las-Foxj1 was also found to be expressed in the prototroch cells and the apical organ of younger larvae (Figure 4—figure supplement 1). As this points towards the formation of cilia by the PRCs, we screened the apical surface of the PRCs for cilia by means of electron microscopy (Figure 3A–E). Indeed, we found two cilia in each PRC in addition to the many microvillar extensions (Figure 3A,C,D), corroborating ultrastructural data from other chitons (Bartolomaeus, 1992; Fischer, 1980; Rosen et al., 1979). The cilia show a 9 × 2 + 2 microtubule pattern (Figure 3C inset). Neither the cilia nor the microvillae exceed the cuticle nor exhibit specialized surface extensions (Figure 3A,C), but they are longer than the rudimentary cilia found in surrounding epithelial cells and do not taper (Figure 3A,C,E). As we were interested in whether the cells feature a mechanism to transport opsin into cilia, we looked into transporters that are known to be involved in ciliary opsin targeting. Although the C-terminal VxPx motif known for cargo binding in vertebrate (but not protostome) c-opsin is not conserved in xenopsins (Figure 4—figure supplement 2), several ortholgos of the general players of ciliary targeting that are also active in ciliary opsin targeting, namely Las-Arf4, Las-rab8, Las-FIP3, Las-RPGR and Las-MyosinVIIa (Liu et al., 1999; Wang and Deretic, 2014, 2015; Wang et al., 2012), were found to be specifically expressed in the PRCs by double in-situ hybridization with Las-r-opsin (Figure 4B–F, Figure 4—figure supplements 3–5). In vertebrates, c-opsins drive the important process of vision, as they constitute the visual pigments of the retinal rods and cones and they serve additional functions when expressed in the pineal or in deep brain PRCs. Thus, the identification of c-opsins in protostome invertebrates provided the possibility to explore the role of c-opsin+ PRCs in distant relatives and to uncover the evolutionary roots of vertebrate vision. For a long time, only very few protostome c-opsins were known and these unambiguously group within the clade of c-opsins. This narrowed down the choice of potential study subjects. Basically, there were few pteropsins from arthropods and one sequence from the annelid Platynereis dumerilii (Arendt et al., 2004; Eriksson et al., 2013; Velarde et al., 2005). In addition, new protostome sequences, which resemble c-opsins in certain aspects, were not instantly included in broad opsin analyses and this led to weakly supported orthology assignments that suggested a broader distribution of c-opsins in protostome invertebrates. Seemingly, this is not the case. Initial evidence that the new sequences do not encode c-opsins, but are closer affiliated to cnidops, has been provided by Hering and Mayer (2014), though with low support. This new group included sequences of hitherto uncharacterized visual pigments from the mollusks Crassostrea gigas and Lottia gigantea, a sequence from the brachiopod T. transversa that originally was described as c-opsin (Passamaneck et al., 2011) , and a weakly associated sequence from Strongylocentrotus purpuratus (opsin2) that did not group with other major opsin sequence groups in other analyses (D'Aniello et al., 2015; Ooka et al., 2010; Raible et al., 2006). Probably because of the increased taxon sampling and formal tree reconciliation, the recent phylogenetic study of Ramirez et al. (2016) provides for the first time strong support for a new group of xenopsins, which are distinct from c-opsins. We show that irrespective of the remarkable mutually exclusive taxonomic distribution of xenopsins and c-opsins, this distinction does not rely on tree inference artifacts, as can be seen from the specific gene structures of both opsin types. Our data reveal a broader occurrence of xenopsins in protostomes than hitherto anticipated, pointing towards a high relevance of this opsin type in animal physiology. Accordingly, xenopsins are present not only in mollusks, rotifers and brachiopods as already reported by Ramirez et al. (2016), but also in several flatworms and in Oweniidae, the first branch within annelids. The situation in nemerteans is not clear because the screened RNA-seq datasets are probably not representative due to the low total number of opsins found. In accordance with Ramirez et al. (2016), we have no evidence that xenopsins exist in deuterostomes. Strongylocentrotus purpuratus opsin2 is the only deuterostome sequence that has ever been suggested to show affinities to sequences now classified as xenopsins (Hering and Mayer, 2014). However, the high similarity of the gene structure to that of Lingula anatina peropsin A strongly supports a position of both sequences in the ancient small group of bathyopsins sensu Ramirez et al. (2016), which exclusively comprises only a few echinoderm and brachiopod sequences. Nevertheless, the data provide clear evidence that xenopsins were already present in the last common ancestor of deuterostomes and protostomes. In the analysis of Ramirez et al. (2016) and in our study, xenopsins form the sister group to cnidops, and this may very likely reflect the evolutionary history. As the basal interrelationships of the major opsin groups were shown to be strongly affected by outgroup composition, taxon sampling, tree inference algorithms and parameters (compare Cronin and Porter, 2014; Feuda et al., 2012, 2014; Hering and Mayer, 2014; Porter et al., 2012), this hypothesis may, however, need further investigation. Unfortunately, gene structure data are not informative due to the lack of introns in cnidops. For this reason and in contrast to Ramirez et al. (2016), we apply the term xenopsin only to bilaterian sequences and not to cnidops. Nevertheless, the assumption that xenopsins emerged within protostomes would require a sister group relationship between xenopsins and another clade of protostome-specific opsins. This would need major rearrangements of opsin tree topology and is not supported by gene structure data. In the (unlikely) scenario that xenopsins do not turn out to be sister to cnidops, it remains to be determined whether xenopsins were already present in the ancestor of Bilateria or emerged in the last common ancestor of protostomes and deuterostomes. This depends on the final phylogenetic position of acoelomorphs in relation to Bilateria and on further upcoming sequence data. We could not detect any xenopsin or c-opsin in the screened RNA-seq data from seven acoelomorphs and one xenoturbellid. According to our data, frequent lineage-specific loss of either xenopsins or c-opsins (or both) during animal evolution has to be assumed. To date, no explanation can be given as to why the two opsin groups do not co-occur in a single organism. The intriguing possibility remains that an underlying causal relation drove the evolution of a large protein family that way. This will be an interesting case to study on the molecular physiological and the genomic levels. The observed co-expression of xenopsin and r-opsin in the eye PRCs of L. asellus is remarkable from a functional perspective. As a general observation, the vast majority of PRCs express only one type of visual opsin. In nearly all cases where more than one visual opsin was found in PRCs, the respective opsins belong to the same opsin subgroup and evoke the same phototransduction cascade. This has been shown for r-opsins in several arthropods, as for example in the eye PRCs of Limulus polyphemus (Katti et al., 2010), fiddler crabs (Rajkumar et al., 2010) and a butterfly (Arikawa et al., 2003), and for c-opsins in for example mice (Applebury et al., 2000), guinea pigs (Parry and Bowmaker, 2016), salamander (Isayama et al., 2014) and cichlid fishes (Dalton et al., 2015). In most cases, expansion or tuning of the visual spectrum is the suggested function. Co-expression of opsins belonging to different, evolutionary distinct opsin types is reported only very rarely, as in the case of the annelid P. dumerilii, where Go-opsins and r-opsin are employed in eye PRCs (Gühmann et al., 2015). Here, the main function likewise seems to be the expansion of the visual spectrum of the cells. Our findings in L. asellus point towards another direction. The L. asellus eye PRCs express all relevant elements of standard r-opsin-mediated GNAQ-dependent IP3 signaling (Vöcking et al., 2015). By contrast, the NKQ tripeptide motif present in L. asellus xenopsin is known to be involved in the GNAI- and cGMP-based signaling (Marin et al., 2000) of c-opsins and is similar to motifs in cnidops, some of which were shown to mediate GNAS- and cAMP-based signaling (Koyanagi et al., 2008; Liegertová et al., 2015). The eye PRCs might thus be able to integrate different light signals directly. To our knowledge, the only case known in which co-expressed opsins evoke competing signaling cascades is in the pineal of the lizard Uta stasburiana (Su et al., 2006). Functional analysis of the molecular physiology of the L. asellus eye PRCs may thus be of great interest to sensory biologists. Xenopsins are seemingly able to enter cilia. This type of opsin is employed in the purely ciliary PRCs of the larval eyes of the brachiopod Terebratalia transversa (Passamaneck et al., 2011). We find it expressed in eye PRCs in L. asellus, whose microvilli employ r-opsin (Vöcking et al., 2015) but which also have cilia. The expression of Arf4, rab8, FIP3 and RPGR provides the possibility that these proteins are involved in xenopsin trafficking, as they are in c-opsin ciliary trafficking in vertebrate rods and cones (Liu et al., 1999; Wang and Deretic, 2014, 2015; Wang et al., 2012). As the C-terminal VxPx motif necessary for the Arf4-mediated transport of vertebrate c-opsins (Wang and Deretic, 2014) is missing in xenopsins, Arf4-mediated transport of xenopsin would require other protein interactions. Interestingly, the same holds true for ciliary transport of cnidops and of c-opsins from organisms other than vertebrates and tunicates, as the VxPx motif is only conserved in the latter opsin groups and not in cephalochordate, echinoderm or protostome c-opsins or cnidops, some of which have been shown to be expressed in ciliary PRCs (Arendt et al., 2004; Bielecki et al., 2014; Kozmik et al., 2008; Vopalensky et al., 2012). It may be that Arf4 binding to c-opsins other than those of vertebrates and tunicates, xenopsins and cnidops relies on other protein interactions as in the case of vertebrate c-opsins. As an alternative, Arf4-complex-mediated ciliary opsin trafficking has to be regarded as a chordate invention. Our extensive data mining did not change the picture that arthropods and certain annelids are the only organisms in which insights can be obtained on the physiological role of the protostome counterparts of vertebrate visual pigments. C-opsins have been found in no other protostomes. As outlined above, xenopsin-employing PRCs are promising study subjects for many other questions in sensory biology. Furthermore, we propose that data on the employment of xenopsins have significant impact on the understanding of the evolution of animal eyes and of photoreceptor cell types in general. As discussed below, we regard the presence of xenopsins in ancestral eyes as a likely scenario. This implies that the occurrence of xenopsins in the eyes of protostomes is not due to the flexible recruitment of opsins in existing eyes during evolution or to frequent invasion of new kinds of photoreceptor cells into eyes, but rather to inherited employment in an ancestral eye photoreceptor cell type. The wide distribution of r-opsin+ cells in the eyes of protostomes and deuterostomes, alongside the reported similarities in molecular physiology and the process of cell specification, have been interpreted by many studies as a sign of common evolutionary origin and the presence of r-opsin+ rhabdomeric PRCs in the eye of the last common ancestor of bilaterians (Arendt, 2008; Arendt et al., 2002a; Koyanagi et al., 2005; Lamb, 2013; del Pilar Gomez et al., 2009). Data on c-opsins, however, were interpreted in different ways. The pivotal role that c-opsins play in the rods and cones of vertebrate eyes is obvious and findings from the cephalochordate frontal eye suggest that c-opsin+ ciliary PRCs were the predominant eye sensory cells already in the last common ancestor of chordates (Vopalensky et al., 2012). In protostomes, c-opsins were initially described only in the brain (Arendt et al., 2004; Beckmann et al., 2015; Velarde et al., 2005), which corresponds to their broad occurrence in the brain of basally branching deuterostome c-opsins such as encephalopsins (Blackshaw and Snyder, 1999; Nissilä et al., 2012). Thus, it has been suggested that c-opsin+ PRCs did originally not form part of eyes, but were rather localized deeply in the brain and not associated with screening pigment (Arendt, 2008; Arendt et al., 2004; Lamb, 2013). They secondarily invaded the eyes of chordates, but stayed within the brain in protostomes. The presence of ciliary PRCs revealed by structural studies of the eyes of some protostome groups (Purschke et al., 2006; Salvini-Plawen, 2008; Woollacott and Eakin, 1973; Woollacott and Zimmer, 1972) would contradict this scenario if those cells showedmolecular characteristics similar to those of c-opsin+ brain PRCs. Accordingly, the discovery of a c-opsin that is expressed in ciliary eye PRCs of a brachiopod put forward alternative explanations favoring a higher lability of PRC function and multiple independent recruitments of r-opsin+ and c-opsin+ PRCs for directional vision in animal eye evolution (Passamaneck et al., 2011). These data conflicts are resolved by the fact that all c-opsins that were previously reported from the visual cells of protostome eyes turned out to be xenopsins instead of c-opsins, according to Ramirez et al. (2016) and our study . The only exception relies on a PCR-based report of a true c-opsin in an onychophoran eye (Eriksson et al., 2013), but this is contradicted by a cellular expression analysis by Beckmann et al. (2015) showing that c-opsin is absent from the eye retina layer and only present deeply within the brain and the optical ganglia. By contrast, all existing data on the expression of xenopsins point towards their presence in eyes. The opsin reported from brachiopod larval eyes (Passamaneck et al., 2011) is a xenopsin. We detected xenopsin in eye PRCs of a mollusk and in a few extraocular PRCs, which are regarded as derivatives of cerebral eyes (Vöcking et al., 2015). RNA-seq data from cephalopods likewise suggest the presence of xenopsins in eyes (Yoshida et al., 2015). One option to explain the appearance of xenopsin in protostome eyes is to assume repeated recruitment of xenopsins into this context. This implies the co-option of xenopsin by ancestral microvillar r-opsin+ eye PRCs in eyes like those of L. asellus. In purely ciliary eyes such as those in brachiopods, either the formerly r-opsin+ cells completely changed identity or the original PRCs were replaced by new ciliary xenopsin+ PRCs, or the whole eyes arose completely de novo while the ancestral microvillar eyes were reduced. Abrupt changes and new inventions would be important and frequent events in eye evolution. Alternatively, assuming the presence of both r-opsin and xenopsin in ancestral eyes provides probably a simpler explanation (Figure 5). Notably, this is not in conflict with the absence of xenopsins in the eyes of well-studied protostomes such as arthropods, or certain annelids, as secondary loss of xenopsin in the respective lineages is clearly evident from sequence resources and opsin phylogeny. R-opsin and xenopsin may initially have been employed in different cells, but a very attractive hypothesis is that cellular co-expression of r-opsin and xenopsin, like that which we observed in the eyes of L. asellus, is not an exceptional case but is inherited from ancestral eye PRCs that employed both opsins and exhibited microvilli and cilia (Figure 5). The cerebral eye PRCs of mixed microvillar/ciliary organization described in some organisms (Blumer, 1996; Hughes, 1970; Zhukov et al., 2006) may have barely maintained the ancestral organization, whereas microvillar eye PRCs may have emerged by reducing the cilia in taxa in which xenopsin was secondarily lost and the only visual pigment that survived is that associated with microvilli. Vice versa, purely ciliary eye PRCs, as have been described in several protostomes (Blumer, 1994, 1999; Passamaneck et al., 2011; Woollacott and Eakin, 1973; Zimmer and Woollacott, 1993), may have formed coincidently with downregulation or complete loss of r-opsins. The ancestral r-opsin+ and xenopsin+ PRC type may have arisen within the protostome branch leading to lophotrochozoan organisms (variant A in Figure 5), but even a much earlier origin is conceivable (variant B in Figure 5) as the absence of xenopsins in deuterostome eyes can easily be explained by the obvious secondary loss of this visual pigment in these animals. Scenarios for eye PRC evolution. C-opsin, xenopsin and r-opsin are present in the bilaterian ancestor. Scenario A. In the bilaterian ancestor, c-opsin is employed by ciliary unpigmented brain PRCs not serving directional vision. Initially the only eye PRCs are of the r-opsin+ microvillar PRC type. In protostomes, c-opsin+ PRCs stayed in the brain and do not form part of the eye retina layer in recent arthropods and annelids, but became integrated into the eye retina of vertebrates. They were reduced in mollusks and brachiopods coincident with gene loss of c-opsin. One option preventing the assumption of multiple co-option of xenopsin by eye PRCs or emergence of completely new PRCs or eyes is that xenopsin was recruited once by r-opsin+ eye PRCs in the stem lineage of lophotrochozoans and entered sensory cilia. Such cells are still present in basal mollusks. In annelids except the basally branching Oweniidae (labelled with asterisk), xenopsin is lost and the eye PRCs are turned into purely microvillar cells. In brachiopod larvae, xenopsin is maintained and present in the purely ciliary eye PRCs. Scenario B. The evolution of ciliary c-opsin+PRCs is the same as in Scenario A.However, already the eyes of the bilaterian ancestor employed a very plastic mixed r-opsin+ and xenopsin+ rhabdomeric/ciliary PRC type. Distribution of PRC types and eye PRC organization in Bilateria is largely the result of lineage-specific loss of either xenopsin or c-opsin. Loss of xenopsin in vertebrates, arthropods and most annelids led to microvillar r-opsin+ PRCs. Though still present in the genome, r-opsin became downregulated in eye PRCs of brachiopods. Schemes are partly based on drawings and images from Rhode (1992) and Passamaneck et al. (2011). The scenario outlined above links back to older debates about PRC evolution and the ancestral function and significance of vestigial cilia found in many invertebrate microvillar eye PRCs. The vestigial ciliary structures described vary in the length and in the structural organization of the microtubular axonem and the ciliary rootlet, and often only basal bodies are found (Eakin and Westfall, 1964; Eakin, 1972; Turbeville, 1991; Verger-Bocquet, 1992). These structures were often interpreted as remnants of the motile cilia of the epidermal cells from which the PRCs initially originated (Arendt et al., 2009; Eakin 1979, 1982; Mayer, 2006). Derivation from sensory cilia was only assumed in the context of a hypothesis proposing that animal eye PRCs originated multiple times within the different animal groups from inconspicuous cells enrolled in a diffuse dermal light sense (von Salvini-Plawen and Mayr, 1977; Salvini-Plawen, 2008). This thesis was contradicted by the upcoming molecular physiological and developmental data favoring conserved evolutionary lineages of r-opsin+microvillar and c-opsin+ ciliary PRC types (Arendt, 2008; Arendt et al., 2004; Fernald, 2006; Lamb, 2013; Shubin et al., 2009). However, the observed cellular co-expression of r-opsin and xenopsin in cells bearing microvilli and cilia now suggests that vestigial cilia in microvillar PRCs may indeed also go back to cilia with sensory functions. It is worth noting that the often inconspicuous primary cilia known from most kinds of vertebrate cells are considered to be sensory organelles that are important for proper cell function, intercellular signalling and development (Malicki and Johnson, 2017; Singla, 2006; Walz, 2017). Last but not least, the distinction between motile and sensory cilia is no longer regarded as clear cut. More and more motile cilia that also display sensory capabilities are being reported (Kleene and Van Houten, 2014; Shah et al., 2009; Warner et al., 2014) and the distribution across eukaryotes of molecular components relevant for locomotion and sensation suggests that cilia were enrolled in both functions upon their emergence (Bloodgood, 2010; Johnson and Leroux, 2010; Mitchell, 2007, 2017; Quarmby and Leroux, 2010). The same is conceivable for cilia in ancient photoreceptor cells. As current data only show use of xenopsin, but not of c-opsin, in the ciliary structures of protostome cerebral eyes, the described scenario is in line with the hypothesis that the cerebral eyes of animals employ only few different PRC types. This scenario does not require the assumption of multiple recruitments of sensory cilia and/or visual pigments or PRCs by cerebral eyes or of multiple origins of those entities. Instead, the PRCs employed in prostostome cerebral eyes are rendered as representatives of a highly plastic cell type. The ratios of microvilli/cilia and of r-opsin/xenopsin, and in consequence the downstream targets and the physiological properties of the PRCs, may have changed repeatedly within evolutionary lineages unless either the r-opsin or the xenopsin genes were finally lost. Subsequent studies on xenopsin+ PRCs may thus strongly impact the understanding of the degree to which conserved cell types and the properties of sensory cells can change over time and of how these changes occur. In conclusion, opsin phylogenetic analyses combined with gene-structure analysis strongly confirm the existence of an old clade of xenopsins, which is evolutionarily distinct from c-opsins. The physiological role of this opsin type is not yet understood and requires further studies, especially in the interesting case of co-expression with r-opsin. The taxonomic distribution and the available epression data suggest that xenopsins may play a pivotal role in tracing PRC and eye evolution in bilaterian animals. The dichotomous classification of eye PRCs into ciliary c-opsin+ and rhabdomeric r-opsin+ cell types may no longer be appropriate, and the documented presence of xenopsin in eye PRCs may be due to common ancestry. The described evolutionary scenario provides simple explanations for the origin of eye PRCs exhibiting both microvilli and cilia and for how purely ciliary PRCs may have emerged in protostome eyes, and it rises intriguing questions of how much conserved cell types can change over time. Adults of L. asellus were collected close to the Norwegian coastline in Bergen during the period from September to December 2015 and kept in the dark at 8°C. They were cultured in groups of female and male animals and fertilized egg balls were collected each morning. Larvae were kept on a light/dark cycle of 12h/12 hr at 18°C. The assembly of Illumina (San Diego, California, RRID:SCR_010233) HISeq RNA-seq data of 2–11d old larval material described by Vöcking et al. (2015) was used to identify transcripts of interest via bidirectional blast. Whole transcripts and fragments were then amplified by PCR using gene-specific primers and cDNA prepared with Super Script II (Thermo Fisher Scientific, Waltham, Massachusetts) RRID:SCR_008452), subsequently ligated into pgemT-easy vector (Promega, Madison, Wisconsin, RRID:SCR_006724) and cloned into Top10 chemically competent E. coli (Thermo Fisher Scientific). Sanger sequencing was used to verify the cloned sequences before DIG- and FITC-labeled sense and antisense probes were generated with T7- and SP6-RNA Polymerases (Roche, Basel, Switzerland, RRID:SCR_001326) or with the Megascript Kit (Thermo Fisher Scientific). Reciprocal blast yielded unambiguous results for gene orthology assignment of Las-FoxJ1, Las-MyosinVIIa, Las-rab8a and Las-RPGR. In all other cases, public databases (GenBank (RRID:SCR_002760), JGI (RRID:SCR_002383), Uniprot (RRID:SCR_002380)) and the Leptochiton transcriptome were screened for homologs by text search, blast (RRID:SCR_004870) and HMMER (RRID:SCR_005305) with respective query sequences or domain profiles for subsequent gene tree generation based on maximum likelihood and Bayesian inference. Sequence alignments with MAFFT (RRID:SCR_011811) 7.221 (EINSI option) were manually curated. Best fitting substitution models were selected with ProtTest (RRID:SCR_014628) 3.4 according to Akaike information, Bayesian information and Decision theory criteria or with the RAXML (RRID:SCR_006086) based ProteinModelSelection script by Alexandros Stamatakis. Maximum likelihood analyses were run with RAXML 8.2.8 on the Cipres Science Gateway (RRID:SCR_008439, Miller et al., 2010) with gamma modeling of rate heterogeneity and rapid bootstrapping with automatic stop by majority rule criterion autoMRE. Bayesian analyses were run with Phylobayes (RRID:SCR_006402) 4.1 or Phylobayes-MPI 1.6 using the same substitution models chosen for ML analyses and gamma distribution for rate heterogeneity. Generally, four chains were run and tested for convergence with bcomp command discarding the 20% first cycles as burn-in and used for generating majority-rule consensus trees. As orthology assignment of the new L. asellus opsin sequence obtained from the RNA-seq data is critical for this study, the general routines for phylogenetic inference described above were further adapted to exclude possible artifacts discussed in recent opsin analyses. To evaluate the relationship to c-opsins, ctenopsins, xenopsins, cnidops and anthozoa II opsins sensu Hering and Mayer (2014), a broad sampling of these opsin types across metazoans was included. For this purpose, publicly available sequence resources (GenBank, Uniprot, Genoscope (RRID:SCR_002172), JGI and Macrostomum lignano genome initiative (http://www.macgenome.org)) were screened for homologs by text search, as well as by blast and HMMER searches based on a set of ten query sequences sampled from the above-mentioned opsin groups and the new opsin sequence from L. asellus. We kept only those sequences that exhibited the PFAM 7tm_1 domain, contained the residue Lys296 critical for chromophore binding in opsins, and yielded representatives from the above-mentioned opsin groups amongst the best hits after reciprocal blast against GenBank. In order to reduce the computation time for downstream analyses, sequences yielding c-opsins as best reciprocal blast hits were down-sampled in taxa such as vertebrates and arthropods, where high numbers of sequences were obtained. As the number of sequences retrieved was low for several prostostome taxa, such as annelids, nemerteans, platyhelminths and ecdysozoans others than arthropods, as well as for acoelomorphs, which form a potential sister group to all other bilaterians (Cannon et al., 2016), we performed a second round of sampling for these taxa following different strategies. Three complete opsin sequences were obtained from the Hypsibius dujardini NCBI TSA archive, matching the published incomplete sequences for c-opsin1, c-opsin2, and c-opsin3, which lacked position 296 and thus were initially removed from the dataset. Illumina RNA-seq raw data were downloaded with fastq-dump from the NCBI SRA (RRID:SCR_004891) read archive for the nemerteans Baseodiscus unicolor, Cerebratulus sp., Lineus longissimus, Nipponemertes sp., Paranemertes peregrina, Malacobdella grossa, Cephalothrix hongkongiensis, Hubrechtella ijimai, Tubulanus polymorphus, the flatworms Stenostomum sthenum, Kronborgia amphipodicola, Geocentrophora applanata, Prorhynchus sp., Echinoplana celerrima, Prostheceraeus vittatus, Prosthiostomum siphunculus, Stylochus ellipticus, Itaspiella helgolandica, Microdalylellia schmidti, the acoelomorphs Ascoparia sp., Diopisthoporus longitubus, Eumecyonostomum macrobursalium, Isodiametra pulchra, Meara stichopi, Nemertoderma westbladi, Sterreria sp. and the xenoturbellid Xenoturbella bocki . From these data and from our own RNA-seq data from several developmental stages from the annelid Owenia fusiformis, transcriptome assemblies were generated using Trimmomatic (RRID:SCR_011848) 0.36 for adapter and quality trimming, Rcorrector (Song and Florea, 2015) for read error correction and trinity-2.2.1 for read assembly. Blast databases were generated with the NCBI blast+-suite and screened with tblastn (RRID:SCR_011822) for opsins with a query set of 38 opsin sequences representing all of the major opsin subgroups reported in Hering and Mayer (2014) and Ramirez et al. (2016). Only sequences that exhibited the PFAM 7tm_1 domain, contained Lys296 and yielded c-opsins, ctenopsins, cnidops, anthozoa II opsins sensu Hering and Mayer (2014) and xenopsins amongst best hits were retained. The SMEDG Unigene dataset available at the Schmidtea mediterranea Genome Database (RRID:SCR_007934) was screened with the same search strategy. Other opsin types, such as r-opsins, Go-opsins, RGR/peropsins, and the recently described chaopsins and bathyopsins were sampled to a lesser degree to reduce computation time of downstream analyses. As the choice of outgroup has been shown to be critical for opsin tree inference (Feuda et al., 2012; Plachetzki et al., 2007), we used a broad sampling of opsin sequences as queries to search for closely related GPCRs. This led to an outgroup consisting of melatonin, octopamine, dopamine and adrenergic receptors, and placopsins similar to those in the analysis of Hering and Mayer (2014) and more diverse than those in the analyses of Feuda et al. (2012, 2014) and Ramirez et al. (2016). Sequences were first aligned with MAFFT 7 with option E-INS-i. Then, ambiguously aligned N- and C-terminal regions were trimmed, sequences shorter than 160 amino acids removed and the remaining sequences again aligned with MAFFT 7 with option E-INS-I. The output was manually edited to remove gappy regions and ambiguously aligned positions, yielding an alignment of 282 positions and 258 sequences. Feuda et al. (2012, 2014) and Hering and Mayer (2014) showed that data-set-specific substitution matrices can fit opsin alignments better than precomputed models implemented in tree inference software. Thus, we used RAxML to generate such a dataset-specific substitution matrix (DS-GTR) by parameter optimization of the general time reversible (GTR) model to the trimmed alignment and a precomputed parsimony tree. In ProtTest 3.4, the implemented model FLU was exchanged against our DS-GTR, revealing DS-GTR+Γ as best fitting model according to Akaike information, Bayesian information and Decision theory criteria (Figure 6—figure supplement 1). For maximum likelihood analyses, RAxML 8.2 was run on the CIPRES Science Gateway (Miller et al., 2010). A first run was conducted with DS-GTR+Γ and 500 rapid bootstraps, yielding low support for basal branching patterns. Hence, a leaf-stability analysis on the bootstrap tree set was conducted with phyutility 2.2 and a few sequences with low leaf stability were excluded from the final data-set used for all following analysis. A new trimmed alignment was generated from the final data-set as described above and a new RAxML analysis with DS-GTR+Γand 1000 rapid bootstraps was conducted. For Bayesian analysis, first a 10-fold cross-validation was run with phylobayes 4.1 to choose the most appropriate combination of GTR, LG and DS_GTR with non-parametric (CAT) or parametric (Γ) modeling of among-site variation or empirical mixture modeling (C20, C30, C40, C50, C60, WLSR5). 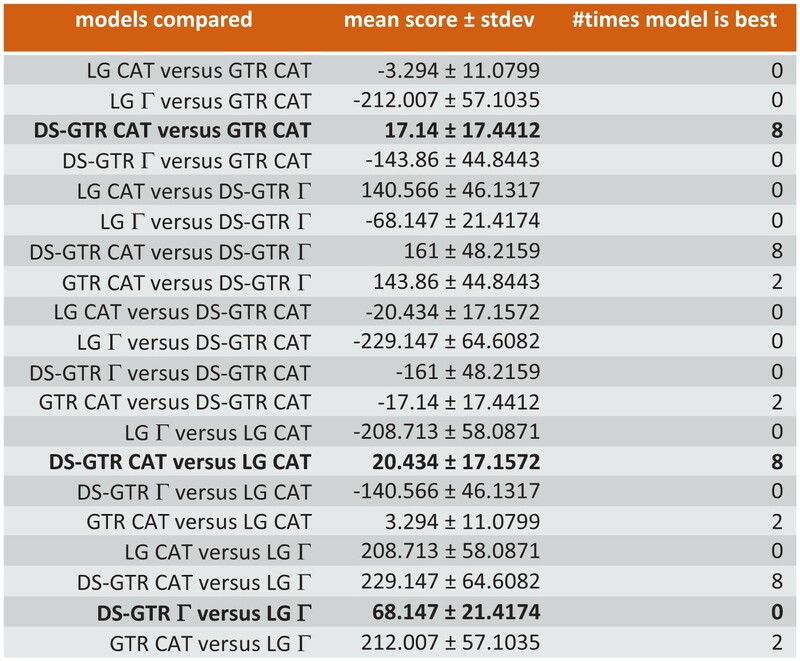 As a result, DS-GTR CAT and GTR CAT were found to be the best non-parametric variants, performing better than the best parametric variant DS-GTR Γ, and all three of these were better than any empirical mixture modeling (Figure 6). For each of the models DS-GTR CAT, GTR CAT and DS-GTR Γ, three chains with 30,000 cycles were run, and for each, chain convergence and mixing behavior was evaluated with the tools tracecomp from phylobayes and Tracer from Beast (RRID:SCR_010228) and a burn-in of 6,000 cycles. Both non-parameteric variants yielded low estimated sample sizes for several model components suggesting poor mixing behavior, which is a known phenomenon of non-parametric models applied to small sequence alignments. Thus, only the chains with DS-GTR Γ, which all yielded high estimated sample sizes, were continued for another 30,000 cycles. Two chains, which exhibited best phylogenetic convergence assessed with bpcomp (12,000 cycles burn-in, mean deviation 0.108), were used to compute the final consensus tree. Ten-fold cross-validation (Phylobayes) to find best possible model for Bayesian opsin tree inference. Only some of the data are shown. Combinations based on the data set specific substitution matrix (DS-GTR) are superior to all software implemented options. DS-GTR CAT and GTR CAT are the best non-parametric variants and DS-GTR Γ is the best parametric variant. See Figure 6—figure supplement 1 for model test for maximum-likelihood analysis and Figure 6—source data 1 for the whole data set. For two opsins (Platynereis dumerilii ciliary opsin (AAV63834.1) and Leptochiton asellus xenopsin) the whole genes were cloned from genomic DNA for subsequent analysis of exon-intron boundaries. Genomic DNA was extracted with the Nucleospin Tissue Kit (Machery-Nagel, Düren, Germany) and tested for fragment lengths larger than 20 kb. As a starting point, gene-specific primers were designed on the basis of the transcript sequences. For genome walking, four libraries were prepared with the Universal Genome Walker Kit (Takara Bio, Kusatsu, Japan) by enzymatic digestion and used for sequence elongation starting from exonic fragments. In parallel, long amplicons bridging smaller introns were also directly amplified from genomic DNA using Lataq (Takara Bio), iProof (Biorad, Hercules, California) and HotStarTaq Plus (Qiagen, Hilden, Germany, RRID:SCR_008539) polymerases. Obtained amplicons of up to 8 kb were cloned using a pGem-T easy Vector (Promega) TOPO XL PCR cloning kit (Thermo Fisher Scientific), TopTen chemically competent cells (Thermo Fisher Scientific) and Sanger sequenced. Obtained sequences were used to design further primers for ongoing sequence elongation. Read assembly was performed with CLC Main Workstation (RRID:SCR_000354) 7.1. WebScipio (Hatje et al., 2011) was used to determine the gene structure including the respective intron phases of all those opsin sequences included in our phylogenetic analysis for which genomic data were available (1) at the WebScipio portal, (2) from other public databases (Kumamushi genome project in case of Ramazzotius varieornatus, or 3) as we cloned the whole genes from genomic DNA (Platynereis dumerilii c-opsin and Leptochiton asellus opsin). The obtained gene structures were than mapped onto the un-curated sequence alignment using Genepainter (Hammesfahr et al., 2013) in order to identify homologous intron positions and to analyze opsin gene structure conservation. To evaluate the stability of the observed patterns against alignment artifacts, gene structures were also mapped onto additional alignments computed with MAFFT (option G-INS-I), ProbCons (RRID:SCR_011813), Muscle and GLProbs (RRID:SCR_002739). Experiments were performed as described previously (Vöcking et al., 2015). In brief, animals were fixed in 4% PFA in phosphate buffer and with Tween20 (PTW; pH 7.4) and subsequently washed and stored in methanol. After rehydration in PTW, samples were briefly digested with Proteinase K, washed and prehybridized in hybridization buffer with 5% Dextran. Samples were hybridized with RNA probes for 72 hr and stained with a combination of FastBlue (Sigma-Aldrich, St. Louis, Missouri, RRID:SCR_008988) and Fast Red (Roche). The significance of expression signals was evaluated by using sense probes as control experiments. All in-situ hybridization experiments were performed on at least 30 specimens per gene for each sense and anti-sense probe and the experiments were repeated at least twice. Light microscopic images were taken using Eclipse E800 (Nikon, Tokyo, Japan) and AZ100M (Nikon) microscopes and adjusted with Adobe (Mountain View, California) Photoshop (RRID:SCR_014199) CS5. Confocal images were taken with a SP5 confocal microscope (Leica, Wetzlar, Germany, RRID:SCR_008960) and the image stacks processed with ImageJ (RRID:SCR_003070) and Adobe Photoshop CS5. Experiments were performed as previously described (Vöcking et al., 2015). Briefly, animals were fixed in 2–5% glutardialdehyde in sodium cacodylate buffer, subsequently postfixed in 1% osmium tetroxide, en-bloc stained with reduced osmium, dehydrated in a graded ethanol series and embedded in Epon/Araldite. Serial sections of 70 nm were cut with an ultra 35° diamond knife (Diatome, Biel, Switzerland) on an UC7 ultramicrotome (Leica, Wetzlar, Germany) and collected on Beryllium-Copper slot grids (Synaptek, Reston, Virginia) coated with Pioloform (Ted Pella, Redding, California) and counterstained with 2% uranyl acetate and lead citrate. Complete series were imaged with STEM-in-SEM as described by Kuwajima et al. (2013) at a resolution of 4 nm/ pixel in a Supra 55VP (Zeiss, Oberkochen, Germany) equipped with Atlas (Zeiss) for automated large field of view imaging. Acquired images were processed with Photoshop CS5 (Adobe), first registered rigidly followed by affine and elastic alignment (Saalfeld et al., 2012) with TrakEM2 (RRID:SCR_008954, Cardona et al., 2012) implemented in Fiji (RRID:SCR_002285). Philosophical Transactions of the Royal Society B: Biological Sciences 364:2809–2817. The Journal of Neuroscience : The Official Journal of the Society for Neuroscience 23:4527–4532. Journal of Experimental Biology 218:915–922. The Journal of Neuroscience : The Official Journal of the Society for Neuroscience 19:3681–3690. Journal of Cell Science 123:505–509. In: D. M Hunt, M. W Hankins, S. P Collin, N. J Marshall, editors. Evolution of Visual and Non-Visual Pigments. Boston, MA: Springer. pp. 105–135. 625–684, Structure of invertebrate photoreceptors, Photochemisty of Vision, 7. Zeitschrift fur Zellforschung und Mikroskopische Anatomie 62:310–332. In: A Tyler, D Mazia, editors. General Physiology of Cell Specialization. New York: McGraw-Hill. pp. 393–425. In: J Westfall, editors. Visual Cells in Evolution. New York: Raven Press. pp. 91–106. Genome Biology and Evolution 6:2380–2391. Zeitschrift fur Zellforschung und Mikroskopische Anatomie 106:79–98. Journal of Comparative Neurology 522:2249–2265. Trends in Cell Biology 20:435–444. Journal of Experimental Biology 213:2589–2601. Proceedings of the National Academy of Sciences 105:8989–8993. The Journal of Neuroscience : The Official Journal of the Society for Neuroscience 19:6267–6274. Journal of Biological Chemistry 275:1930–1936. Structure and development of onychophoran eyes: what is the ancestral visual organ in arthropods? Arthropod Structure & Development 35:231–245. Proceedings of the Gateway Computing Environments Workshop . pp. 1–8. In: G Jékely, editors. Advances in Experimental Medicine and Biology. Springer. pp. 130–140. Cold Spring Harbor Perspectives in Biology 9:a028290. Journal of Comparative Physiology A 198:833–839. Annual Review of Ecology, Evolution, and Systematics 46:237–260. Trends in Ecology & Evolution 18:623–627. Development, Growth & Differentiation 52:195–207. Investigative Ophthalmology & Visual Science 43:1662–1665. Arthropod Structure & Development 35:211–230. Journal of Experimental Biology 213:4240–4248. Genome Biology and Evolution 26:evw248. In: B. J Bogitsh, F. W Harrison, editors. Microscopic Anatomy of Invertebrates. New York: Wiley-Liss. pp. 285–328. In: J Westfall, editors. Visual Cells in Evolution. New York: Raven Press. pp. 107–136. In: S. L Gardiner, F. W Harrison, editors. Microscopoic Anatomy of Invertebrates. New York: Wiley-Liss. pp. 181–196. In: M Hecht, W Steere, B Wallace, editors. Biology E. Volutionary. New York: Plenum Press. pp. 207–263. In: J Westfall, editors. Visual Cells in Evolution. New York: Raven Press. pp. 137–154. Cell and Tissue Research 369:11–25. Journal of Cell Science 128:1375–1385. Molecular Biology and Evolution 31:18–22. Journal of Ultrastructure Research 43:412–425. Zeitschrift fur Zellforschung und Mikroskopische Anatomie 123:458–469. Integrative and Comparative Biology 55:1070–1083. Thank you for submitting your article "A ciliary opsin-like pigment co-expressed with rhabdomeric opsin in mixed rhabdomeric/ciliary photoreceptors" for consideration by eLife. Your article has been reviewed by two peer reviewers, and the evaluation has been overseen by a Reviewing Editor and Eve Marder as the Senior Editor. The following individuals involved in review of your submission have agreed to reveal their identity: Todd Oakley (Reviewer #3). The reviewers agreed that this paper provides useful and interesting new information relevant to the resolution of opsin evolution. This work reports that a xenopsin is expressed in the larval photoreceptor of a chiton which also express r-opsin and that the cells have not only microvilli, but also cilia, in addition to expressing genetic markers for "targeting of opsin into cilia." These data may help explain why some taxa have photoreceptor cells with both cilia and microvilli and others do not. Xenopsin clearly includes cnidops, and so this group of opsins is very old – dating at least to the common ancestor of cnidarians and bilaterians. 1) The writing must be improved dramatically. This will help make the paper understandable to those outside the evolution of vision field. The writing must be in more standard, grammatical English that will only improve the impact of their work. They need to distill the message and more specifically state the overall importance of the work early on in the manuscript. In addition, they need to incorporate recent work by Ramirez et al. who already named the "col" group as "xenopsins" and came to several of the same conclusions about the distribution of these opsins. This will allow the authors to really highlight the important results they found on co-expression and microscopy. 2) The unique analysis including intron position and phase, of the opsins reveals two group-specific introns that are conserved in position and phase, as opposed to three unrelated introns in the c-opsin group, and thus lends strong support to the coherence of the Lophotrochozoan col-opsins. This point should be emphasized. 1) Please add accession numbers to the names of the genes. This is important in Figure 1 and in supplemental figures to allow future researchers to repeat/recheck the analyses. 2) The first part of the Materials and methods do not state which substitution model they used (just states 'γ' – looks like they state DS-GTR later). How did you test for convergence of the mcmc? Which leaf stability analysis? The authors must supply accession numbers, ideally directly on the phylogeny in the supplement. What does a "broad and balanced" gene sampling mean (this statement is arbitrary)? It would be very useful to be rigorous about Supplementary files. Speaking from extensive experience here, the authors should include accession numbers for all their sequences. Ideally these would be in the figures of all the trees (as part of the gene names); and perhaps also on a table with species and accession numbers. 4) Regarding the molecular phylogeny, a few important animal groups that are not mentioned, even though they can be mined and would likely be informative. These are the nemertines, the priapulids, and the acoels. They are important because each of them might possess both opsins, and thus would be a good test case for the reciprocal loss paradigm (either the one or the other). This should be mentioned and reasons for exclusion discussed. 5) What are the specific sequence similarity to the c-opsins? Do they go beyond the NKQ motif? If yes, this should be documented. 6) The link between cnidarian and bilaterian opsin groups still appears to be somewhat arbitrary. It appears that there are at least 3 old opsin subgroups, but the link to the bilaterian groups appears to change from paper to paper and is weak at best. Adding to this, the intron analysis does not support a link between cnidopsin and colopsin. This should be mentioned and the possibility that colopsins and cnidopsins are not related should be emphasized. This does not take away from the strength of the paper. Please mention this possibility also in the interpretative scheme (see below). 7) Relating to this, it should be mentioned that the cnidarian anthozoan opsin II group is related to c-opsins by one intron with similar position (Figure 2—figure supplement 2) and in phase (Figure 2—figure supplement 3), which is remarkable, as it strengthens orthology of cnidarian anthozoan II with bilaterian ciliary opsins as postulated by Ramirez et al. This should be highlighted in the manuscript, the more so since it shows that intron conservation between cnidarians and ctenophores is possible. 8) Also, regarding the intron analysis, the 2 introns of the colopsin group may still find counterparts in the c-opsin and opsin-4 groups, if the protein alignment is slightly "corrected" by a few positions. How strong is the AA alignment of the small bits of AA sequence between these intron positions? Alternatively, why are these seemingly different positions not only slight shifts of one and the same intron? 9) Even though somewhat hidden in the literature, there is a lot of evidence that motile cilia indeed belong to the ancient 'equipment ' of rhabdomeric photoreceptor cells, and the authors should discuss this. This has long been stated and is not a novel finding. The senior author has published himself an evolutionary scenario on 'division of labor' between motile ciliated cells and rhabdomeric photoreceptor cells, in line with this. Thus, it is by no means certain that this is a 'ciliary' photoreceptor. The presence of a cilium is rather neutral with regard to this question. 11) Also, it should be stated that the 'transporters known to be involved in targeting opsins into cilia' are in fact more general transport proteins for primary cilia. How can the authors rule out that they are transporting something else? This should be mentioned and discussed. How about the specific ciliary localization signals known to be recognized by these proteins, as mentioned for example in Wang and Deretic 2014? If these signals are not present in the colopsins, this casts doubt on their ciliary transport. The only clear evidence for ciliary localization would be immunolocalization. In the absence of these data, the point remains weak and should be discussed as such. 12) The two interpretation schemes are almost the same. I would propose to unite them both into one scheme (with two variants and question marks) and include this in the main paper. Then, I would urge the authors to also include the possibility that col-opsin is Lophotrochozoan-specific (see my comments above, taking into account that the orthology to cnidopsin is still tentative.) The green colopsin line should thus be dashed outside Lophotrochozoans. Thank you for resubmitting your article "Co-expression of xenopsin and rhabdomeric opsin in photoreceptors bearing microvilli and cilia" for consideration by eLife. Your article has been reviewed by two peer reviewers, and the evaluation has been overseen by a Reviewing Editor and Eve Marder as the Senior Editor. The reviewers have discussed the reviews with one another and the Reviewing Editor has drafted this decision to help you prepare a revised submission. I think the authors have carefully considered all the scientific points raised by the reviewers. I think the paper in much improved in that respect, with the importance, and uniqueness showing more. We hope you will be able to deal with the further textual changes listed below and return a final revised version as quickly as possible. The evolution of opsin, the seven-transmembrane domain protein that collaborates with a chromophore to transform photons into electrical signals, preceded the evolution of eyes. In extant animals, opsins located in eyes in cilia and rhabdomeres are used by cells differing fundamentally in structure and molecular physiology, such as ciliary vertebrate rods and cones and protostome microvillar eye photoreceptors. 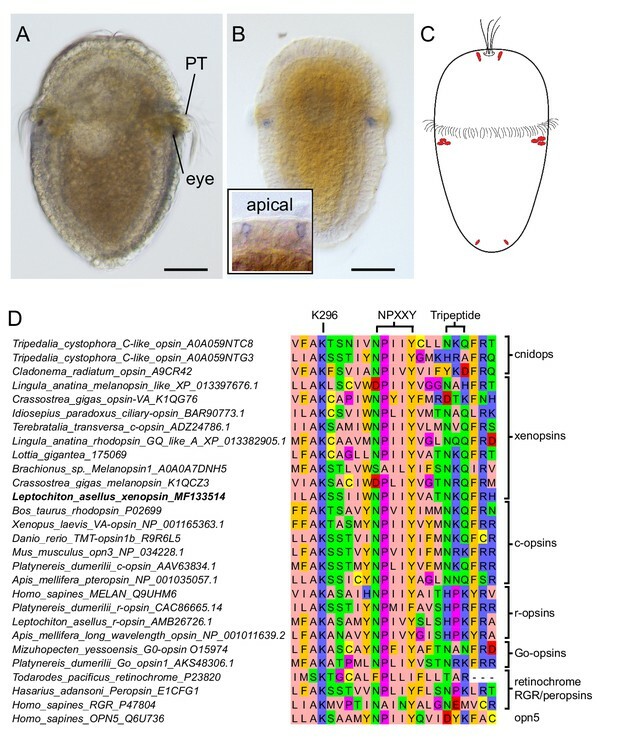 The authors report unprecedented cellular co-expression of rhabdomeric opsin and a visual pigment of the recently described xenopsins in larval eyes of a mollusk. The photoreceptors have both microvilli and cilia and express transporters for microvillar and ciliary opsin trafficking. Gene structure shows that xenopsin and ciliary opsins are of independent origin irrespective of their mutually exclusive distribution in animals. The authors propose that xenopsins are ancient components of animal eyes and initially may have been employed by a highly plastic photoreceptor cell type of mixed microvillar/ciliary organization. Frequent secondary loss of opsins likely played a key role in the early evolution of animal photoreceptors influencing the organization and function of photoreceptor cells found in brains and eyes extant animals. 1) Justify the choice to make the non-opsin outgroups monophyletic, in contrast to previous results (especially Feuda et al. PNAS, 2012)? Please avoid the word "basal" to describe a living species (as in "larval eyes of a basal mollusk"). "Transporters for opsin". To be precise you found homologs of proteins known in other species to be transporters. "today living animals" is not grammatical. You mean "extant animals". "in times," is not grammatical. I think you can remove it. First paragraph; Photoreceptors are not the same as eyes. I suppose you might be discussing old debates, but these lines make it seem like PRC=eye. Second paragraph; "upcoming" is the wrong word. You mean "Subsequent". Second paragraph; Evolution-based (needs hyphen). Remove the word "meanwhile", it is not grammatical as written. Second paragraph, last sentence; Not grammatical. This is a key sentence, where the authors are trying to state why a general reader should care about all the detail they are laying out. This important sentence needs to make sense, and be grammatical. (and probably should not be the last sentence of a paragraph). Third paragraph; "enrolled" is wrong word. "are involved in", perhaps. Third paragraph; "In consequence". Not grammatical. Last paragraph; "independent evolutionary origin". Misleading. They are both opsins. What you mean is they are paralogs, not orthologs. Last paragraph; Living animals are not "basal". Last paragraph; What does "signaling mode" mean? Subsection “A new xenopsin from the chiton Leptochiton asellus”, first paragraph; "a few cnidops". The original name is "cnidops" not "cnidopsin". You also need the "a" to get across what you mean. "Since the distinction between xenopsins and c-opsins is so far only based on maximum- likelihood tree inference, we performed both maximum-likelihood and Bayesian analyses." This is not a logical statement. By this logic – you should also perform Parsimony, Neighbor Joining, and random tree generation. Furthermore, a lot of this is methods. Why is it in the Results section? Subsection “A new xenopsin from the chiton Leptochiton asellus”, first paragraph; What special care? Subsection “A new xenopsin from the chiton Leptochiton asellus”, first paragraph; "Own". Do you mean newly generated data? Subsection “A new xenopsin from the chiton Leptochiton asellus”, first paragraph; A living annelid is not basally branching. Subsection “A new xenopsin from the chiton Leptochiton asellus”, last paragraph; "paralogs distribute within and outside of a well-supported xenopsin subgroup". Not clear what that means. Subsection “Gene structure supports independent origins of xenopsins and c-opsins irrespective of their mutually exclusive distribution”, first paragraph; "are available" is the wrong word. "are recovered" – perhaps or "are identified" (if you want to stick with passive voice). Subsection “Gene structure supports independent origins of xenopsins and c-opsins irrespective of their mutually exclusive distribution”, first paragraph; – The living annelid is still not basal. Subsection “Gene structure supports independent origins of xenopsins and c-opsins irrespective of their mutually exclusive distribution”, second paragraph”, last sentence; "anyway" is not usually used this way in written English. Subsection “Gene structure supports independent origins of xenopsins and c-opsins irrespective of their mutually exclusive distribution”, last paragraph” Again "independent" is misleading. They are both opsins, but different paralogs. Subsection “Gene structure supports independent origins of xenopsins and c-opsins irrespective of their mutually exclusive distribution”, last paragraph; – "corroborate" -> "corroborating". "Highly conserved but distinct gene structures suggest that xenopsins and ciliary opsins are of independent origin, irrespective of their mutually exclusive distribution in animals." Introduction: "By deeply mining public and new data we find xenopsins to be present in several taxa of protostome invertebrates." Please be more precise, otherwise you suggest a broader distribution than detected: "… to be present in several taxa of protostome lophotrochozoans." "several general players of ciliary targeting also active in ciliary opsin targeting…"
Discussion: I don't understand why you write "presence of xenopsin in ancestral eye PRCs seems likely". What do you mean by 'ancestral' here? Do you mean the ancestor of all bilaterians? Any ancestor (like of chitons)? Ancestor of all eyes. First sentence; Retina -> retinal. Third sentence; Grammar problem – as written, this sentence means only a few protostome sequences were known. You mean that only a few protostome c-opsins were known. Second paragraph; “Probably due to the increased taxon sampling…” and due to formal reconciled tree analysis. Fifth paragraph; Idea – the convergent evolution of the NKQ motif made xenopsin and c-opsins use the same phototransduction cascade. This could make them redundant, and allow for only one to usually be retained. Subsection “Opsin tree inference”, second paragraph; Should cite Cannon et al. for Xenacoelomorpha. Subsection “Xenacoelomorpha”, second paragraph; But the papers you cite show that including distant GPCR outgroups is a problem, yet that is what you chose to do. Why did you decide to root the tree with all the non-opsins as monophyletic? Others have found that Trichoplax opsin is a sister group to canonical opsins. Your tree is consistent with this, but you seemed to have chosen the outgroups to be monophyletic, with no justification as to why. We rewrote many passages in order to improve the English. We further restructured the Introduction and parts of the Results and Discussion in order to stress more the significant findings and statements. Following the recommendations from the reviewers we screened under-sampled taxa for opsins. This required de novo assembling of numerous publicly available RNA-seq data sets and to rerun all opsin phylogenies and gene structure analyses. Materials and methods were extended to provide more details on the tree inference as it was suggested from the reviewers. All figures on opsin phylogeny and gene structure are updated. We discuss now the study of Ramirez in more detail and took over the term xenopsin. However, since gene structure data do not provide additional support for the proposed sistergroup relationship of cnidopsins and bilaterian xenopsins, we prefer to apply the term xenopsins only to bilaterian sequences and not to cnidopsins. Although we refer many times to Ramirez, we have to discuss the distribution of xenopsins as well in detail. First, we found xenopsins in additional taxa and second, we are the first describing the remarkable mutually exclusive distribution of xenopsins and c-opsins. We fully agree that the performed gene structure analysis adds very valuable information for unravelling opsin evolution. We regard the observed differences in gene structure between xenopsins and c-opsins as a valuable piece of information, which is independent from tree inference and provides strong evidence that these two opsin groups are really distinct, irrespective of their mutually exclusive taxonomic distribution. - the divergence of anthozoan opsin II and ctenopsins and the possible relationship of these opsins to c-opsins. Accession numbers are now added to all sequences presented in figures and also provided as additional data with the only exception of those sequences still awaiting approval and curation from GenBank. We give now a much more precise description of the opsin tree inference in Materials and methods. We describe now in detail the sequence sampling procedure, which had the aim to obtain a data-set covering c-opsins, cnidopsins, ctenopsins, xenopsins and anthozoa opsins II from very many taxa. Since we were aiming computational very extensive Bayesian analyses we reduced sequence sampling in groups like vertebrates and arthropods, where many sequences are reported and in other opsin groups, which are not in focus of the study. We describe how a data-set specific substitution matrix (DS-GTR) was generated to apply the best possible evolutionary models in maximum-likelihood and Bayesian analyses. We also describe how different models were tested (ProtTest for maximum likelihood and 10 x cross validation for Bayesian analyses) and added respective figures (Figure 6, Figure 6—figure supplement 1) and the whole datasets (Figure 6—source data 1, Figure 6—figure supplement 1—source data 1) to the manuscript. We describe how model mixing behaviour, and how phylogenetic convergence of Bayesian runs was estimated and we provide the relevant information about the leaf stability analysis. Accession numbers have been added to all listed sequences and are also provided as additional data with the only exception of those sequences still awaiting approval and curation from GenBank. Accession numbers have been added to all listed sequences in all figures and are also provided as additional data with the only exception of those sequences still awaiting approval and curation from GenBank. 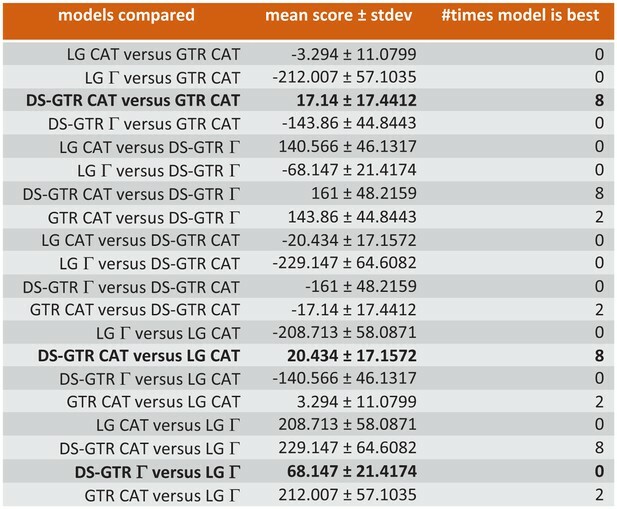 Further, we show now the metrics of the model tests performed. Public genomic data of priapulids suggest that priapulids are devoid of opsins. No or only very few opsin sequences are available for other protostome groups such as nemerteans or acoels. Thus, we downloaded for the revised version of the manuscript raw Illumina RNA-seq data sets (SRA archive) from Genbank for 9 nemertean, 7 acoelomorph, 1 xenoturbellid and in addition 10 platyhelminth taxa and computed for all data de novo assemblies, which than were screened for opsins similar to c-opsins, xenopsins, anthozoan opsins2, cnidopsins or ctenopsins. Indeed we found some new sequences, which add valuable information to the analysis. Further, we found one new sequence in the SMEDG database of the flatworm Schmidtea mediterranea and we retrieved complete sequences from the Genbank TSA archive matching the publicly available fragments of Hypsibius dujardini c-opsins, which than also were included into the data set. As a consequence, we run all opsin tree and gene structure analyses anew from scratch. The whole process was computationally demanding and thus, we mention the significance of the RNA-seq screens several times in Results and Discussion. The screened data provide clear (and new) evidence for the presence of xenopsins in flatworms, but not in acoels or nemerteans. No, sequence similarity between several xenopsins and c-opsins is to our knowledge restricted to the presence of the NKQ tripeptide motif. We agree that the basal branching patterns in opsin phylogenies differ considerably between studies and depend obviously strongly on taxon sampling, choice of outgroup and probably tree inference algorithms and parameters. Our phylogenetic analysis differed in many of these aspects from the study of Ramirez et al. (2016), but likewise recovered the sistergroup relationship of xenopsins and cnidopsins. However, gene structure analysis could not corroborate this grouping, since cnidposins lack introns. In difference to Ramirez et al. (2016), we thus prefer to use the adopted term xenopsins not for cnidopsins, but exclusively for sequences from bilaterians. This is now also mentioned in the manuscript. To address this aspect in more detail we considerably enhanced the number of anthozoan opsins II included in the analyses. However, we do not see clear evidence for a close relationship of anthozoan opsin II and c-opsins. 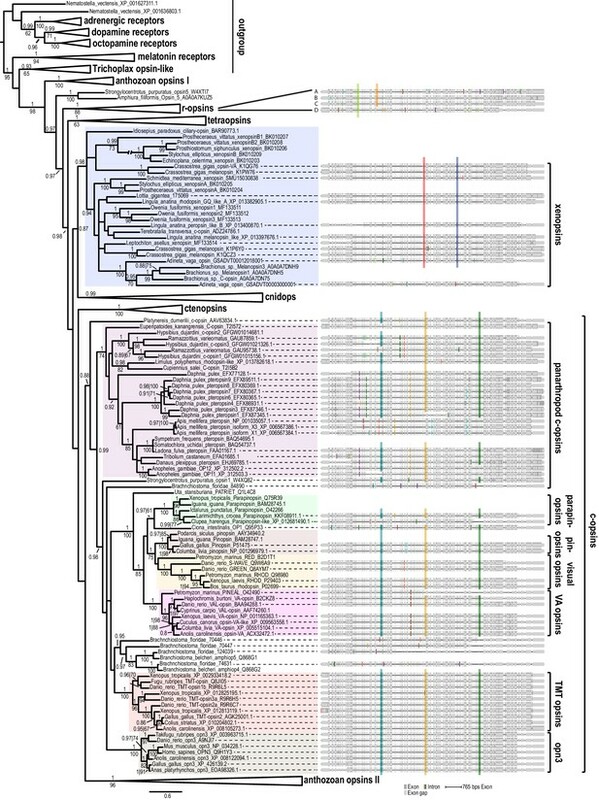 Interestingly, the increased sequence sampling shows that anthozoan opsins II consist of two different subgroups with evidence from opsin tree and gene structure. Conserved anthozoan II opsin introns, however, do not match in position and phase to any conserved c-opsin intron. We agree that the first conserved xenopsin intron matches in phase and has a position close to the second conserved c-opsin intron. To evaluate, whether the slight difference in position may be due to alignment artefacts and thus mask a common evolutionary origin, we mapped the gene structures on another 4 alignments generated with other alignment tools or parameters (MAFFT- G-INS-I, GLProbs, ProbCons, MUSCLE). In no case the respective intron position were overlapping. This observation is now described in the manuscript. For illustrations we prepared additional figures similar to Figure 2—figure supplement 2, where the gene structures are mapped on the new alignments. We were not sure, whether inclusion of so many similar figures into the manuscript would be appropriate or an overload. Thus, we did so far not include these figures, but we will be glad to provide them, if this is desired. Intron drift describes small positional (few basepairs) changes of introns. It seems to be a rather rare phenomenon in eukaryotes (see e.g. Roy, S (2009). BMC Evol. Biol. / Bocco SS et al. (2016). Genome Biol. Evol. or Li et al. (2017), Yangtze Medicine). Nevertheless, we cannot completely rule out that the mentioned introns in xenopsins and c-opsins were not affected by intron drift. The assumption of a common origin of the first conserved xenopsin intron and the second conserved c-opsin intron would require intron drift of one of the introns in the stem lineage of either c-opsins or xenopsins. This is not impossible, but we do not see any evidence for this. Furthermore, even the assumption of a common origin of the mentioned introns, would not change the main conclusions of the study. Even then two c-opsin and one xenopsin introns are remaining, which do not match introns in the other opsin group. This does not point towards an integration of xenopsins within c-opsins or vice versa. Only a sistergroup relationship of xenopsin and c-opsins could be conceivable, although this would be in conflict with the opsin tree. Anyway, the main statement that c-opsins and xenopsins were present as distinct groups already in the last common ancestor of protostomes and deuterostomes would not change. We do not see evidence for the presence of a conserved shared intron in xenopsins and tetraopsins. The one conserved tetraopsin intron, which is close in position to the second conserved xenopsin intron differs in intron phase. Similar to the case described above, the difference in position is retained when gene structures are mapped on other alignments. Rather a closer relation of ctenopsins to c-opsins may be inferred from the gene structure data. According to our tree, ctenopsins diverged into two subgroups, which share some introns, but show also subgroup specific introns. One subgroup specific intron matches in phase and position with the third conserved c-opsin intron. Since only sequences from 2 ctenophore species were included in the analysis more reliable statements on this topic may require the advent of genomic resources of further ctenophore species. We discuss this topic now in more detail in the manuscript. Indeed, the presence of rudimentary cilia in microvillar PRCs is well documented. It has been interpreted in different ways. 1) those cilia were assumed to be remnants of motile cilia from epidermal cells (of the neuroectoderm), which gave rise to the PRCs. 2) An inductory function of the cilia for the development of cilia was assumed, which was never confirmed by empirical data. 3) A former sensory function was only assumed in context of a hypothesis favouring multiple origins of eye PRCs and eyes in general from inconspicuous cells bearing microvilli and cilia enrolled in a diffuse dermal light sense. This view was contradicted by upcoming molecular data clearly favouring common origin of many eye PRCs and existence of only few different eye PRC types. Xenopsin has been shown to be strongly expressed in eye PRCs of purely ciliary organization (brachiopod larvae) and we find it in cells bearing microvilli and cilia and expressing transporters known to be involved in cililary opsin trafficking (see below). From these observations we draw the conclusion that the cilia of the eye PRCs of L. asellus may have a sensory function. Presence of a central pair of microtubule in the ciliary axoneme is not informative. It is required for motility and not for a sensory function, but it does not contradict a sensory function. Indeed many sensory cilia described contain a central pair of microtubules. A motile function is unlikely, since the cilia do not penetrate the cuticle. Noteworthy, the last two decades brought into light that most cells of vertebrates bear small inconspicuous cilia (primary cilia), which are sensory and fulfil highly important functions in intercellular signalling and development. Moreover, the distinction in motile and sensory cilia is meanwhile no longer regarded as clear cut. Several cases were documented, where motile cilia take also in a sensory function and many data point towards a dual function of the cilia from early eukaryotes. In consequence, a dual function sensory motile function of cilia in ancient photoreceptors is likewise conceivable. 10) Also, it should be stated that the 'transporters known to be involved in targeting opsins into cilia' are in fact more general transport proteins for primary cilia. How can the authors rule out that they are transporting something else? This should be mentioned and discussed. How about the specific ciliary localization signals known to be recognized by these proteins, as mentioned for example in Wang and Deretic 2014? If these signals are not present in the colopsins, this casts doubt on their ciliary transport. The only clear evidence for ciliary localization would be immunolocalization. In the absence of these data, the point remains weak and should be discussed as such. Immunolocalization of the opsin certainly would add valuable data to the manuscript. Actually, we prepared several custom antibodies for this purpose, but these did not give any specific signals, what unfortunately happens quite often with custom made antibodies. Albeit we regard it as very likely that xenopsin is able to enter cilia due to its documented strong expression in the larval brachiopod ciliary eye PRCs, whose cilia give rise to a very large sensory membrane surface. Arf4, FIP3, Rab11 and ASAP1 are well known as important actors for targeting vertebrate rhodopsin into the ciliary outer segment of rods and cones. According to the literature two motifs are known which are of high relevance for cargo binding: The C-terminal VxPx motif and the FR next to the tripeptide motif within the 8th TM helix. L. asellus xenopsin is lacking the VxPx motif. This observation may be interpreted as arguing against the proposed transport of xenopsin into the cilia of the L. asellus PRCs. But, from our data it is clear that ciliary opsin targeting does not depend on the presence of the VxPx motif. By aligning the C-terminal ends of all investigated sequences it became obvious that the VxPx motif is conserved throughout vertebrate visual opsins, pinopsins, parapinopsins, VA-opsins and encephalopsins and Ciona-op1, but nowhere else. Notably, the VxPx is absent in the c-opsins from cephalochordates (where c-opsin expression has been reported from the ciliary frontal organ), echinoderm c-opsin and all protostome c-opsins (where likewise c-opsin expression has been reported from ciliary PRCs). It is generally lacking in xenopsins (where expression is known in purely ciliary PRCs) and in cnidopsins (which also are known to enter cilia). Either all those opsins depend on completely different targeting systems (and c-opsins switched than to Arf4 mediated transport in the vertebrate lineage) or the Arf4 complex is recognizing other sequence motifs in non-vertebrate opsins. In conclusion we suggest that standard ciliary opsin trafficking takes place in the eye PRCs of L. asellus due to the obvious general capability of xenopsins to enter cilia, the expression of the Arf4 complex genes in the PCRs of L. asellus and the fact that many opsins lacking the VxPx motif are targeted into cilia. As requested, we address this aspect now in more detail in the manuscript. The second motif (FR) involved in Arf4 mediated ciliary targeting of vertebrate c-opsin is highly conserved in many opsin types: c-opsins, xenopsins, cnidopsins, but also many opsins r-opsins, Go-opsins and neuropsins and as such is not informative about trafficking references. However, the FR motif forms in c-opsins part of the larger NKQFR motif, which is conserved throughout c-opsins (also non-chordate and prostome c-opsins) and in many xenopsins (including L. asellus xenopsin). This extended motif is involved in G-protein coupling during signal transduction, but maybe it is also relevant for the opsin targeting. This Certainly, this remains speculative and needs to be investigated. Thus, we do not mention this in the manuscript. 11) The two interpretation schemes are almost the same. I would propose to unite them both into one scheme (with two variants and question marks) and include this in the main paper. Then, I would urge the authors to also include the possibility that col-opsin is Lophotrochozoan-specific (see my comments above, taking into account that the orthology to cnidopsin is still tentative.) The green colopsin line should thus be dashed outside Lophotrochozoans. We combined the two figures into one. Although the relationship of xenopsins and cnidopsins may need further investigation, we see strong evidence that xenopsins were already present in the bilaterian ancestor. Otherwise xenopsins would have to be the sistergroup to another protostome specific subgroup of opsins. And such an assumption would require major rearrangements of the tree topology and thus is regarded as a very unlikely scenario. We admit that we did not pay much attention on outgroup topology when rooting the trees, since the interrelationships of the outgroup GPCRs are not relevant for any conclusion made and are not discussed in the manuscript. In accordance with Feuda et al. (2012), who analysed outgroup interrelationships in more detail, we now root all trees in a manner that melatonin receptors and Trichoplax opsin-like sequences are the closest relatives to animal opsins. Respective changes were made in Figure 2 and Figure 2—figure supplement 1. In addition, the order of outgroup sequences was changed in Figure 1—figure supplement 1, Figure 2—figure supplement 2, Figure 2—figure supplement 3 and Figure 4—figure supplement 2. The changed root position does not in any sense affect opsin ingroup relationships or statements made. We deleted the word basal in the Abstract and corrected the wording in other sentences throughout the text. Following the suggestions for the Abstract (see also further down) increased word number above the limit of 150 words. To overcome this situation we changed the order and wording of sentences in the second half of the Abstract. We now clearly distinguish between PRCs and eyes. We changed the sentence a bit to correct grammar and moved it and the subsequent sentence to the first paragraph of the Introduction. Both terms cnidopsin and cnidops are commonly used by the scientific community, but we agree that Plachetzky et al. (2007) first introduced the opsin subgroup as cnidops. Thus, we changed cnidopsins to cnidops throughout the manuscript. "Since the distinction between xenopsins and c-opsins is so far only based on maximum- likelihood tree inference, we performed both maximum-likelihood and Bayesian analyses." This is not a logical statement. By this logic – you should also perform Parsimony, Neighbor Joining, and random tree generation. The two most accurate and widely used methods for gene tree generation are maximum-likelihood and Bayesian inference. In many studies both methods are applied in parallel and results are checked for congruence. In contrast, maximum Parsimony and neighbour joining are rarely used due to well-known tree interference artifacts. Xenopsins were hitherto only recovered by maximum-likelihood methods. Thus, we were interested, whether xenopsins are also recovered by Bayesian inference. We rewrote the sentence to make our intention more clear. Furthermore, a lot of this is methods. Why is it in the Results section? We describe in the Results section roughly the main steps of the performed analyses, which in our opinion are relevant to understand and to evaluate the significance of the chosen approach. The description is restricted to the choice of main parameters, special efforts in data mining (public raw RNA-seq data) and reasoning why certain sequences were excluded from subsequent analyses. All details are given in the Materials and methods section. We prefer to keep this section as it is, since in our experience this way of writing is quite usual in many papers dealing with extensive molecular phylogenetic analyses. We avoid this wording and rewrote the whole sentence. Subsection “Gene structure supports independent origins of xenopsins and c-opsins irrespective of their mutually exclusive distribution”, first paragraph; The living annelid is still not basal. Subsection “Gene structure supports independent origins of xenopsins and c-opsins irrespective of their mutually exclusive distribution”, last paragraph; "corroborate" -> "corroborating". We kept the original version, since we found xenopsins not only in the lophotrochozoan taxa mollusks, annelids and brachiopods, but also in platyhelminths and rotiferans, which both do not form part of Lophotrochozoa. Above this paragraph we discuss the possibility that the documented presence of xenopsin in eyes of a mollusc and of a brachiopod may be due to common ancestry. We mention both variants without clearly preferring one or the other: presence already in the lophotrochozoan or the bilaterian last common ancestor. In the current paragraph being kind of a conclusion we likewise aim to not prefer one of these variants. We rewrote the sentence to provide a more precise wording. This is a very interesting suggestion. However, we regard (and write in the Discussion) that both Gi/cGMP and Gs and cAMP signalling as described from cnidops (many of which exhibiting motifs similar to NKQ) may be possible in the case of xenopsins. To make things not to complex, we prefer at the moment to leave the Discussion as it is. Certainly, outgroup composition is important in all kind of phylogenetic analyses. While inclusion of divergent outgroup members may distort tree topology by long branch attraction, very small and homogenous outgroups may result in a wrong rooting position. To prevent both problems, we decided to add some other GPCRs (octopamine, serotonin and adrenergic receptors) to the commonly used outgroup members melatonin receptors and Trichoplax opsin-like sequences. We do not regard the added sequences as being distantly related to opsins. They all belong to class α rhodopsin-like GPCRs (see Frederikson et al. (2003): Mol Pharm 63, Mickael et al. 2016: Comp Biochem Phys D 20), group rather close to opsins in Feuda et al. (2012) and are amongst the best blast and HMMER hits of melatonin receptors and Trichoplax opsin-like GPCRs. There is no evidence that these GPCR groups have a negative effect on opsin tree topology. The clear effect on ctenopsin position described in Feuda et al. (2014) was observed, when somatostatin receptors were included, which do not fall into the α group of rhodopsin-like GPCRS and indeed are very likely rather distantly related to opsins. We changed tree rooting accordingly. See first comment. We thank Tomas H Sørlie for his help during field sampling of L. asellus and Egil S Erichsen for technical help with electron microscopic imaging. © 2017, Vöcking et al. A new member of the family of light-sensitive proteins called opsins has stirred up our view of photoreceptors.